ViewVC is a browser interface for cvs and subversion version control repositories. If you are using svn then its a great tool to browse your source code, see history and diffs of multiple file versions. Here are the steps to setup ViewVC on Ubuntu Linux with Apache2 installed. These instructions assume that you have installed and setup svn already. This will create an empty repository at /svn/repos/repo1. It should be owned by www-data as Apache runs as www-data and should be able to write here. 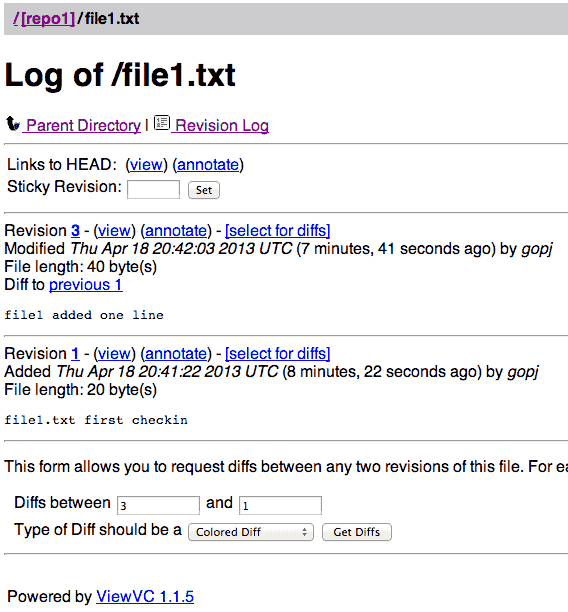 I have also created file1.txt (2 revisions) and file2.txt in repo1 by checking out the source code. This will setup http://yoursvnserver.com/viewvc as url for browsing repository. You can also add multiple svn repositories here by separating them with “,”. e.g. Please note that you must have created these files (using svn) as mentioned above so that they can appear here as list. 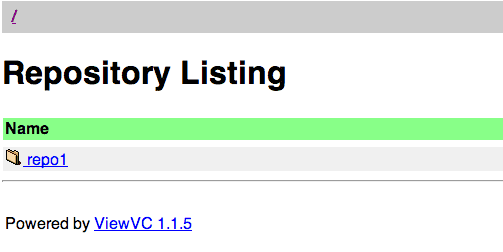 ViewVC is a great ui tool and probably indispensable if you are using svn or cvs for source code version control. Even though you can achieve most of the viewvc functionaries using command line svn command, but viewvc ui is lot more convenient for source code browsing.